Air India will be phasing out its remaining aged Airbus Classic A320 planes by this fiscal. The airline has already retired nine A320s from its fleet and the remaining six planes are likely to go out of service by March next year, Air India Chairman and Managing Director Ashwani Lohani told PTI. The over two-decade-old classic A320, unlike modern aircraft, has a set of bogey wheels. Bogey wheels are a set of four tyres making up one wheel. "We have already retired 9 out of 15 Classics and plan to retire two more in the next two-three months. The remaining four Classics will be phased out by March, 2018," Lohani said. The Indian Commercial Pilots Association (ICPA) -- one of Air India's pilots' body -- while terming the planes as "lethal and snag-prone" had two years back urged the aviation regulator DGCA to ground these planes and ensure passenger safety. In a major bonanza, the Air India has revised the minimum age limit for senior citizens to avail discounted tickets from existing 63 to 60 years, official sources said. As per the revised rules, any senior citizen who is an Indian national, permanently resident in India and has attained the age of 60 on the date of commencement of journey, shall be entitled to a 50 per cent discounted ticket in economy class on the basic fare. Star Alliance members Air India and brussels airlines this month launched reciprocal codeshare partnership, covering service between India and Belgium, as well as selected domestic markets in India. Planned codeshare routes listed below went into effect on/around 23APR17. Air India has added a new A320NEO to the fleet today, as VT-EXG. Air India is offering flexibility in free baggage allowance for international passengers. Now, passengers coming to India and taking a domestic flight can have the same baggage allowance as permitted in their international air ticket. The facility would be applicable for an international Air India traveller taking a domestic Air India flight as well as for those flying an Alliance Air or any code-share local flight, according to a circular. According to the national carrier, passengers who are holding separate international and domestic tickets would be allowed to carry free checked-in baggage as mentioned in the international ticket while taking a local flight. This would be subject to various conditions including that the “onward/ inward travel connection being undertaken within 24 hours on arrival at the domestic airport in India”. On domestic Air India flights, an economy class passenger can carry up to 25 kilogram of checked-in baggage free of cost while the limit is 35 kg for business class travellers. In the case of international flights, this limit is 20 kg and 30 kg for economy and business class passengers, respectively. Weird schedule wouldn't tourists want to leave on a Monday? And same goes for a Simla resident that went to Delhi for the weekend. X2,3 would have been better for a weekend destination. Seriously? Add a new cabin class just because of the MP? Dubai Aerospace Enterprise (DAE) Ltd. today announced it has signed long-term lease agreements for 10 ATR 72-600 aircraft with Alliance Air, a wholly owned subsidiary of Air India Limited. The aircraft are scheduled to deliver throughout 2017 and will be used to grow Alliance’s network and to serve underserved or unserved airports throughout India as part of the Indian Government’s focus on regional air access through the Regional Connectivity Scheme (RCS). Alliance Air is one of five airlines selected to serve routes under this scheme. My guess it will just be extra legroom section like UA (economy plus) and DL have (economy comfort). They should give it free to Star Golds and pay for others. That said, I actually think AI should have a real premium economy on its 77W, 77L and 789. The Indian VFR crowd in the US and UK can actual afford real PE. Just 2 max 3 rows like AF does it. Is there any info about BOM-FRA route? Air India has delayed the launch of its direct flight between New Delhi and Tel Aviv as several countries, including some in West Asia, have denied it overflight permission. The airline had planned to launch the flight this month in the run-up to Prime Minister Narendra Modi’s visit to Israel, expected in July. It will be the first visit to Israel by an Indian Prime Minister. Multiple officials confirmed to BusinessLine that the launch of the direct service has been delayed as the United Arab Emirates, Iran, Saudi Arabia, Pakistan and Afghanistan, among others, have declined permission for the state-owned carrier to overfly their air space en route to Israel. Globally, an airline seeks overflight permission from countries on the route so that the aircraft gets smooth hand-holding from air traffic controllers in these countries. However, the strains in relations between Israel and its West Asian neighbours appear to have impeded the launch of Air India’s service. Flying over West Asia is the shortest route between India and Israel. Air India examined the possibility of operating its Tel Aviv service by flying over Europe, but that plan was dropped as it would have increased the flying time and skewed the economics of the flight. Owing to similar denial of overflight rights by some states, the Israeli national carrier’s flight from Tel Aviv to Mumbai takes about eight hours, an industry watcher said. However, Air India officials maintained that the Tel Aviv service had not yet been put in their booking system, which would have allowed travel agents, tour operators and passengers to make bookings. In March, Air India CMD Ashwani Lohani had been quoted as saying that Air India hoped to start a direct flight between India and Israel in the next few months. He indicated that the launch of the flight would boost tourist traffic between the two countries. Air India has said that they will operate bigger Boeing 777 aircraft between Delhi and Chennai sector starting today to clear the summer rush during the holiday months. “From today, our evening flight between Delhi and Chennai would be operated by a 300-seater Boeing 777. The flight will leave for Chennai in the evening and return to Delhi late in the night. We hope to fill our planes due to the summer travel rush that starts now,” said a senior Air India official, who did not want to be identified. With slots becoming a constraint at Indian airports, Indian carriers are launching bigger aircraft to carry more number of passengers per flight. Air India also feels that the flight with a Boeing 777 aircraft will make money for them, as they will be able to fill large number of its seats in the flight. Air India has stepped up its international expansion plans to the US, Europe and will debut in Africa once again this year, a top executive has said. “To Washington from 7th July, Stockholm from 15th August and Los Angeles from 1st September. Air India spreads its wings far and wide,” Air India chairman Ashwani Lohani said in a Facebook post on Tuesday morning. This will be followed by Tel Aviv in Israel, Dallas in the US and Nairobi in Kenya sometime later in 2017 itself, he said. The Air India flight to Kenya will be the first in recent years. The country hosts a sizeable Indian origin population and has strong trade ties with India. The airline already connects Chicago, New York, Newark and San Francisco with direct flights, some of the longest in the world at over 15 hours. The Washington flights will be on Boeing 777 planes. Why hasn't jet started BOM-NBO on a 737 (Kenya airways flies a 737)? How is AI launching all these flights. Good for them. LA really surprised me (with a 9/1/17 date). I think Dallas is too far in the future so they can change. Plus why DFW and not IAH (which is Star)? So I question DFW. But ARN and LAX really surprised me. Do they even have a spare plane that can fly DEL-LAX? I would have thought the rumored YYZ-BHX-DEL would come first. If Viatara is going to be DEL based and focus on flights West, AI has really raised the bar. I guess UK will be forced to launch nonstop to the US to compete? Air India Express is in discussions with Dubai-based flydubai for collaboration opportunities, including code share among their flights. The move comes at a time when AI Express, which operates a significant number of flights to Gulf nations, is working on ways to spread its wings further. Part of the Air India group, the carrier has plans to fly to new destinations. An official said the airline is discussing ways to collaborate with flydubai for possible sales and marketing beyond Dubai. Various options, including code share of flights and interline agreement, are being looked at, the official added. When contacted, a flydubai spokesperson said India is a very important market for the airline. “We are always looking at new opportunities in the market to facilitate travel between India and Dubai,” the spokesperson said in a e-mailed statement. After more than four decades of existence, Air India Charters Ltd, the holding company of the group’s international budget airline operations, has been renamed as Air India Express Ltd. National carrier Air India’s low cost international budget arm operates under the name Air India Express. The name of Air India Charters Ltd has been changed to “Air India Express Limited” with effect from May 5, according to a communication issued by the Corporate Affairs Ministry. Incorporated way back in September 1971, AI Charters was intended for carrying out charter flight services. With the plan not materialising for decades, the company finally became the holding firm for the operations of AI Express. AI Express, which operates international as well as domestic services, took wings in 2005. Now, after little over 12 years of being operational, the holding entity’s name has been changed to AI Express Ltd.
Air India Engineering Services Limited, a subsidiary of Air India on Friday announced completion of a major maintenance 'C-1' check for the first time of Jet Airways A330 at its Mumbai facility. A330 was a part of Air India fleet till 2014, however to perform third party maintenance check Air India trained its staff and received necessary licenses to deliver major maintenance 'C-1' check for Jet Airways A330. The first Jet Airways A330 aircraft VT-JWR 'C-1' Check was inducted on 26th April, 2017 and was handed over to the airline in a short span on May11,2017. The C-1 check for A330 is done at every 2 Years or ten thousand flight hours whichever is early. Earlier in May,2016 Air India also completed major 'C' check on Jet Airways Boeing B777 aircraft at their Mumbai facility. 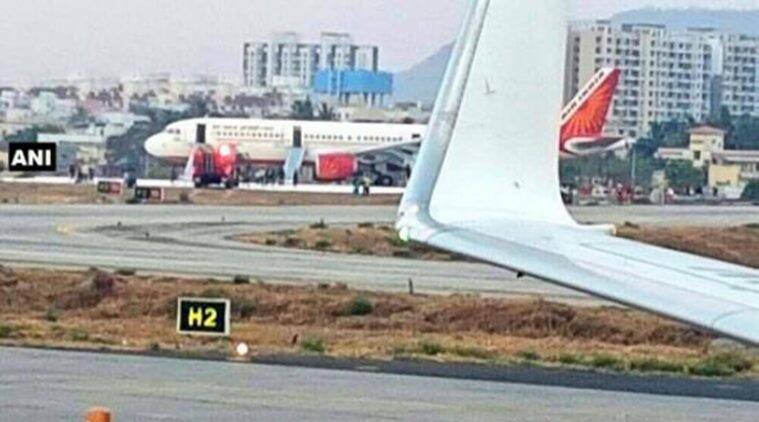 An Air India aircraft with 152 passengers on board overshot the runway while landing in Pune on Friday evening. Luckily the Airbus A-321 (VT-PPA) came to a stop safely an everyone on board was evacuated using emergency chutes. Three passengers reportedly suffered minor bruises during evacuation from the chutes. The runway was closed for flight movements briefly and reopened late on Friday night. 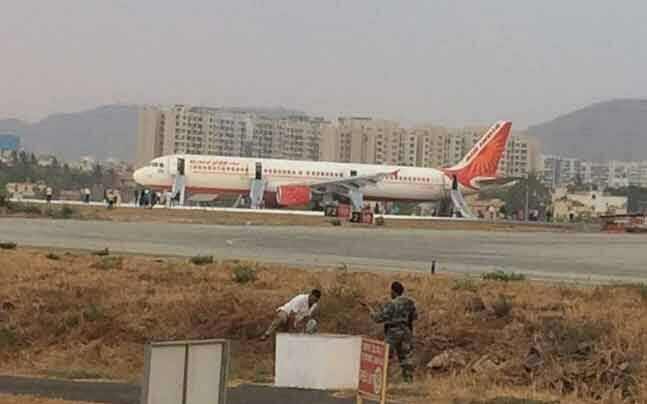 This incident happened when AI 849 was flying from Delhi to Pune and touched down around 6.30 pm. "The aircraft overshot the runway. The plane halted safely and all passengers were evacuated using chutes. All passengers are safe," said an AI official. The right main wheel went into the kutcha area, called runway excursion. "All the wheels are intact so there may be no need to use an aircraft recovery kit to get the A-321 off the runway. The plane can be pulled out," said the official. Air India will operate Boeing 747-400 planes to Kabul for select days in the coming weeks, primarily to ferry cargo. For at least seven days, the national carrier would fly the bigger Boeing aircraft instead of Airbus 320 plane. It operates on Delhi-Kabul route four times a week. Air India in the next few weeks plans to boost capacity to Afghanistan, currently serving Delhi-Kabul route four times a week. Boeing 747-400 -- which has more than 420 seats -- would be operated on May 18, 20 and 21. Besides, the plane would be deployed on June 10, 11, 17, 18 and 20, according to an airline official. The bigger Boeing aircraft are scheduled to be deployed for increased capacity so that pending cargo is cleared, the official added. 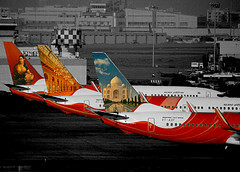 Air India this week expanded capacity offering on Delhi – Chennai route, with the introduction of Boeing 777-300ER service. Since 08MAY17, 2 of 5 daily service switches from Airbus A320/321 to Boeing 777-300ER aircraft, including First Class cabin sevice. Air India in the next few weeks plans to boost capacity to Afghanistan, currently serving Delhi – Kabul route 4 times a week. The following dates will see Boeing 747-400 operating, replacing Airbus A320 aircraft: 18MAY17 / 20MAY17 / 21MAY17 / 10JUN17 / 11JUN17 / 17JUN17 / 18JUN17 / 20JUN17. The airline also operated 747-400 flight on this route on 02MAY17. According to Economic Times, it's because of some cargo which has to be cleared. I wonder what this sudden large cargo would be. #AIUpdate: #AirIndia to launch thrice a week flt (Boeing 787) connecting #NBO & #FRA ex #BOM in July 2017. Stay tuned for updates! Air India on Wednesday said it will commence operations to Stockholm, Sweden, from August 15, 2017. According to the airline, it will launch the three-days-a-week direct flight between New Delhi and Stockholm from August 15, 2017. Last week, Air India's Chairman and Managing Director Ashwani Lohani had said the airline will commence flights to three new destinations in the US besides Stockholm, Nairobi and Tel Aviv during the coming months of 2017. Air India Express from mid-June 2017 plans to increase Kochi – Abu Dhabi operation, currently served 7 weekly. From 15JUN17, the airline will increase service to 10 weekly, further increases to 11 from 21JUN17. Boeing 737-800 operates this route. Air India Express starting today (22MAY17) is expanding Thiruvananthapuram – Muscat service, previously served 5 times a week. The expanded frequency sees overall operation increases to 7 weekly. New flight operates on Mondays and Thursdays, with 737-800. Hopefully this connects well to a few beach/ tourist flights in India - and AI can bring in plane loads of Swedish tourists to Goa/ Kerala/ Assam and the likes! Alliance Air will start its operations on Delhi – Gwalior, Gwalior -Indore and Indore – Mumbai route from May 31. Incredible expansion in Europe with the 787s - it's not that long ago that AI's European network was just London, Frankfurt and Paris. Now it flies to London, Frankfurt, Paris, Birmingham, Madrid, Milan, Rome, Stockholm, Vienna and Copenhagen. Not to mention Sydney, Melbourne and maybe Tel Aviv when Modi goes there, plus San Francisco, Los Angeles, Washington and Dallas/Houston (?) on the 777s. Quite remarkable. The only major cities in Europe left are Manchester & Amsterdam, for AI. Either BOM-MAN or DEL-MAN could work. DEL-MAN would have better connection possibilities and BOM-MAN would have to rely more on O & D than connections. AMS has too many competitors so AI will keep out of this city. This is indeed quite remarkable. I hope that these routes are intended to make a profit, or if nothing else, at least break even over a few years. Apparently taking the Ravindra Gaikwad fiasco to heart, Air India has decided to offer business-class seats in its all-economy aircraft. Shiv Sena MP Ravindra Gaikwad had created a ruckus on an Air India flight in March because it did not have business-class seats, to which he as an MP is entitled. The incident had generated considerable controversy. Going forward, the first three rows of economy aircraft will be makeshift business class seats. The middle seat would remain vacant, and the economy rows would be separated using curtains. The result will be that every aircraft of Air India will have business class seats. In April, Air India irked another MP from Odisha by denying him business class ticket. Arjun Charan Sethi, MP of Biju Janata Dal (BJD) from Bhadrak, said he was told by the airline staff that he could not travel business class as the plane had only economy class seats. Of the 150 aircraft Air India has, about a dozen have only economy class seats. However, the airline takes booking for business class passengers on routes that these aircraft ply. “We usually inform passengers if the all economy class aircraft is plying and the passenger has booked a business class seat. But this was leading to confusion and often passengers were getting to know about it after reaching the airport,” an official said. Air India has added a new A320NEO to the fleet today, as VT-EXU. The flights to Copenhagen will start from 16th September, a month after the airline starts flights to Stockholm Arlanda. With over 29 million passengers in 2016, Copenhagen is the largest airport in Nordic. The airport is a hub for fellow Star Alliance member SAS / Scandinavian Airlines. Indeed Sir, thanks for the analysis. The hub seems to be working quite well, and the planned expansion can only make the coming days better for AI.